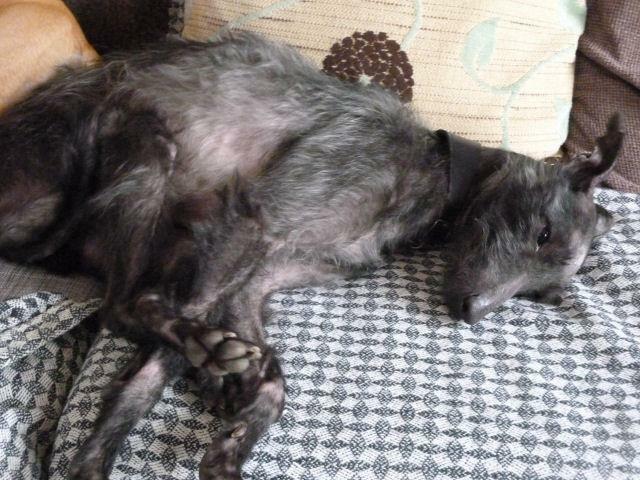 Homing Requirements: Neville is seeking a companionship home and will delight living with other dogs and/or children. Neville needs an inclusive home where he is allowed free range within the home with access to furniture. Neville needs a 6'panel secure garden and exit management of doors and gates to avoid him getting out. He is sensitive and needs a considered and caring approach. Found stray in a poor physical state he has achieved his target weight and enjoys good health and energy. His Story: Neville was found stray and starved so the dog warden allowed us to bring him straight into foster with the understanding that we would return him if a responsible owner came to reclaim him - they didn't. Neville was homed with his current owner but sadly she suffers poor health so she is forced to offer Neville back for rehoming but is able to support him until his new family can be found. Neville is neutered, chipped and vax'd. Currently in Elstead, Surrey with his owner. Advert: Neville is a wonderful boy! A relaxed, tail wagging cuddle monster! He is friendly to everyone and every dog and ideally would like to live with another dog. He likes to be with you so not to be closed off in the kitchen overnight and also makes full use of the sofas. He would love to be in an inclusive home where he can cuddle up to you and watch TV on the sofa and sleep upstairs. 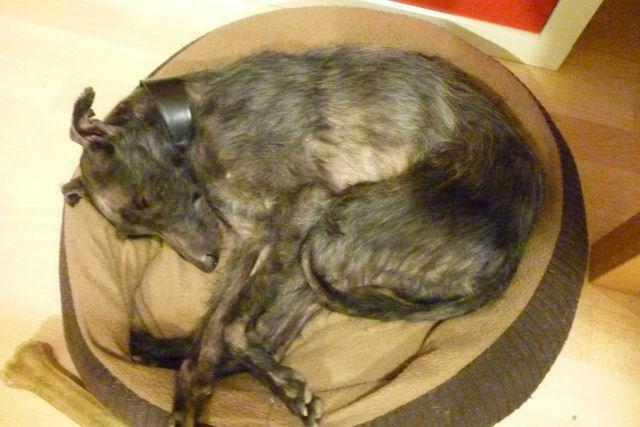 Neville is a mini Lurcher (only 20" to the shoulder) and around 6 years old. He loves to sleep after his walk. Neville needs lots of love and comfort and he will reward you with devotion and gentle snores. Neville is sensitive. Weather sensitive - doesn't want to go out in the rain if he can avoid it. Noise sensitive but less and less so. Touch sensitive - learning to trust touch without freezing and he now lies next to you and is so happy. Original Referral Info: Early April 13 Hi Lynne Why do I only ever contact you when I need something? 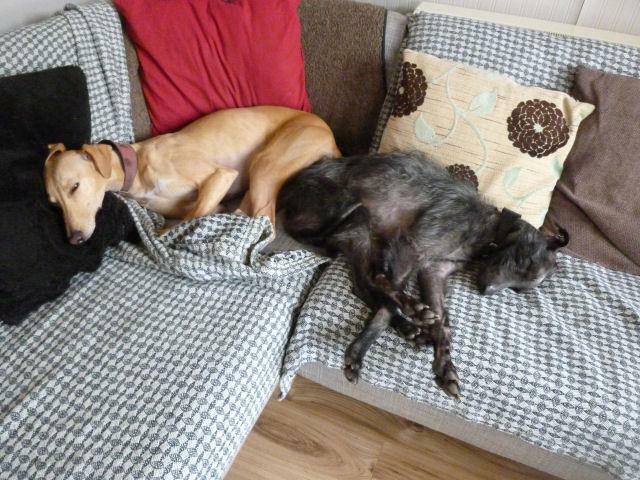 I picked up a cross breed dog yesterday, lurcher type, whippet size. He is very underweight with the usual skin conditions, more from neglect than anything else. We took him to the vets who said he is 4 or 5 years old, no real health issues that a bit of TLC won’t resolve. So, my reason for contacting you. Just sometimes, a dog will twang at my heart strings. This little feller was cowering in the corner when I picked him up, frightened out of his life. As soon as he realised I didn’t pose a threat, he just gave himself up to me without any sign of aggression, allowing me to carry him to the van. He was very calm and good natured at the vets, and is now being looked after at the local pound. My concern is that he is a classic style of dog who will find his way back into the wrong hands, and if possible, I would like him away from the borough and out of circulation. Do you have any contacts for a dog of this type?